SET OF 4 - YOU CHOOSE THE DESIGNS. See additional images for design names and choices. 28" - YES - they are large!!!!!! 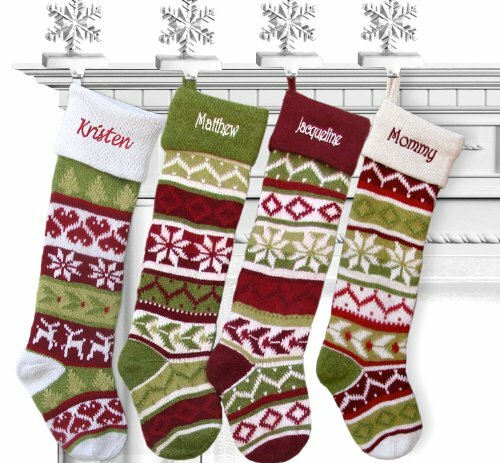 red, green and white knit personalized Christmas stocking - Lined inside for ultimate luxury feel.. Measured along the diagonal from the top left hand corner to the toe, the stocking measures 28 inches, and the width along the cuff is 6.5 inches. Names can be personalized on the cuff of this Christmas stocking with WHITE, GREEN: DARKER OR LIGHTER GREEN, GOLD, SILVER embroidery thread To compliment the colors of the stocking. ******* IMPORTANT: ******* TO INDICATE YOUR PERSONALIZING CHOICES, USE THE GIFT MESSAGE BOX ON THE CHECKOUT SCREEN OR CLICK CONTACT SELLER AFTER YOU PLACE THE ORDER. 3. White Cuff Snowflake Body : Joey : Green thread 4. White Cuff Deer Hearts Body: Maria : Burgundy thread. For RED CUFF- SNOWFLAKE BODY, put "B009RQ6L74" in AMAZON Search Box. For GREEN CUFF-SNOWFLAKE BODY, search for "B009RQMKEM"
For WHITE CUFF-SNOWFLAKE BODY, search for "B00AAZ4P8I"
For WHITE CUFF-HEARTS N SNOWFLAKES BODY, search "B00FOC279Q" . Personalized FREE using embroidery fonts in choice of Christmas metallic thread. ****** IMPORTANT ********* Enter Personalizing and Design Choices in the Gift Message area upon check out OR click contact seller after you place your order. SET OF 4 Stockings - each Christmas Stocking is 28" size measured from the top left hand corner diagonally to the tip of the toe. About 6 inches wide at the top. If you have any questions about this product by CHRISTMAS-STOCKINGS-by-STOCKINGFACTORY, contact us by completing and submitting the form below. If you are looking for a specif part number, please include it with your message. Mark Roberts Let It Snow Fairy Stockingholder 2015 24.5"